Whimbrel Nature: Who Needs Sun For Sunflowers? Who Needs Sun For Sunflowers? In the past two weeks I've had a couple of opportunities to head back out to McKee-Beshers Wildlife Management Area in Poolesville, MD, for the large fields of sunflowers, which (unlike last year) are in great form. This time around, since I've photographed here before, I wanted to get something a little different, so I showed up right at sunset each time. While I got a few sunset images (which I'll share in my next post), my main purpose was to wait for dark and do some light painting. For those unfamiliar with light painting, you shoot under dark conditions and "paint" in the light, wherever you want it, using a variety of flashlights and/or other illumination accessories. You can also combine this technique with night photography of the sky, moon, and/or stars. 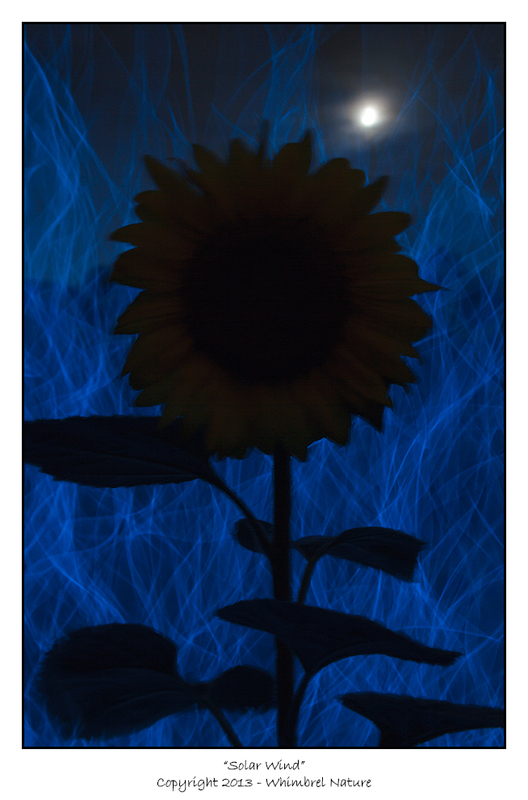 The sunflowers made amazing subjects for light painting and I was very happy with the results. Despite the mosquitoes, poison ivy, and one visit from curious police officers, I had an incredibly fun time making these images. My only wish is that I could have had a few more wind-free hours to try out more possibilities. It is important to note that other than combining some images using the "Lighten" mode in Photoshop (done to combine the lighting effect of more than one image and/or to avoid long exposure noise), these images are essentially as captured in camera and accurately represent the spatial arrangement of the subjects in real life. They are not cloned or composited from daylight images. Other than the artificial lighting and the techniques needed to pull that off with good quality, they are not overly manipulated. 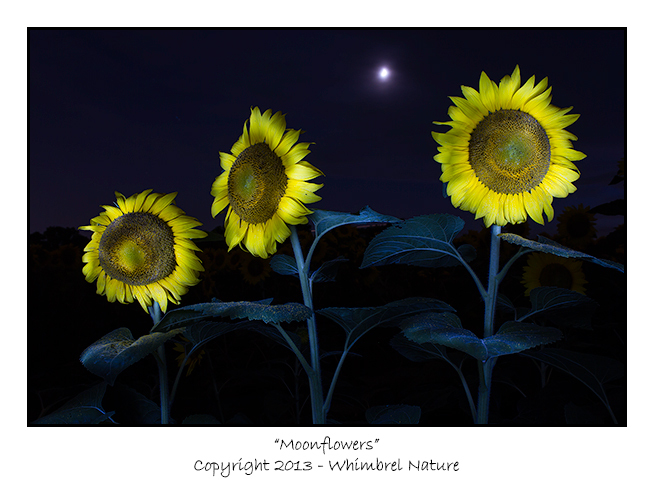 The first image in this series "Moonflowers" is one of my personal favorites. I took this in the main field off River Road on July 13th. The moon was in a perfect position for photographing in conjunction with the "painted" flowers, although sometimes covered with a thin layer of clouds. This particular image is a blend of two images. In one I painted mostly the flower heads, in the second I painted the leaves and stalks. I blended the two images using the "Lighten" mode in Photoshop, but the moon had moved enough in between exposures so I had to mask out the moon in one exposure to avoid a double moon. I used a single LED bore light (on a flexible stalk for cleaning gun barrels) to paint the sunflowers. Using a small bright LED held close to the subject gives the lighting on the sunflowers that mottled look, rather than the more diffuse/even effect of a brighter light (or flash) held farther away. 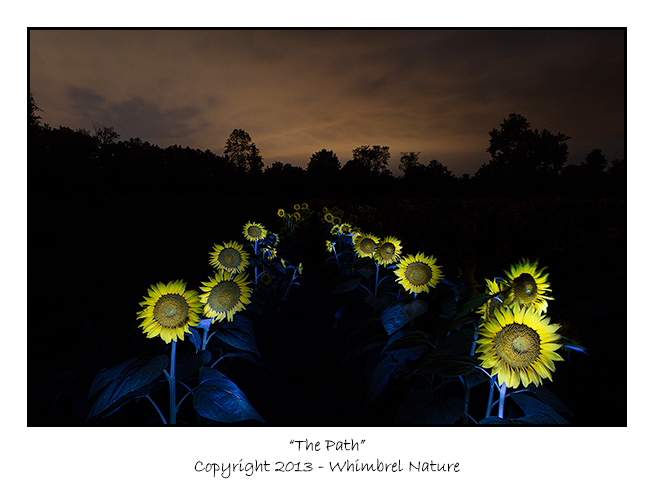 "The Path" was created on July 20th at the field off of Sycamore Landing Rd. (the main field off River Road was literally "going to seed" at this point). The most difficult part of creating this image was finding a time when the persistent breeze from the major thunderstorms to the Northeast of me died enough to paint the whole row without getting a lot of motion blur. This is a blend of four images. Three images to get all the sections of the rows, in 30 second increments, and a fourth for the sky. For this one, I was using a mini multi-LED flashlight and scooting down the middle of the two rows on the ground to paint the sunflowers. "Twilight Flower" was taken on July 13th at the River Road field, just after sunset. For this image I actually blended about 17 images in "Lighten Mode" in Photoshop. I was shooting at f/16 and 100 ISO, so I could only illuminate very small sections of the flower at a time. Again the small single LED light held close and the fact that each stroke of the light didn't provide that much illumination gives that uneven "light reflected off of water" effect on the plant. I couldn't resist playing with my EL wire (I get so few opportunities) and the result is "Solar Wind". Originally I had envisioned blending it with a light painted version of the sunflower, but with the bright flower it just looked fake and cheesy. Then I thought I'd leave it as a silhouette, but the silhouette wasn't that strong or crisp and so it still didn't look that great. Then I realized that bringing out just a little bit of the color and detail in the very underexposed flower gave the effect I wanted. It gives an almost pastel-like feel to the flower and matches well with the ethereal background. To achieve this effect with the EL wire, I just swirled it around, back and forth, behind the flower during the length of the exposure, being careful to keep most of my body out of the frame so the light from the wire didn't produce ghost images of me. This one is a single image with no blending in Photoshop. 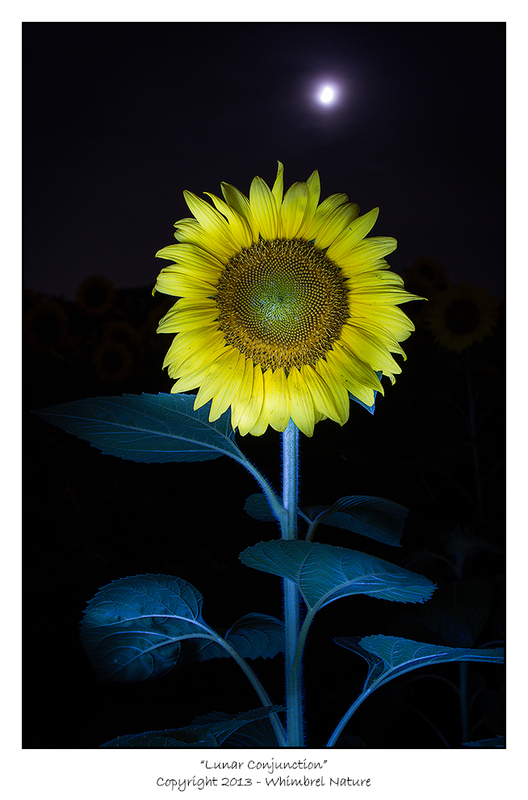 The last image in this series "Lunar Conjunction" is sort of a vertical version of "Moonflowers", utilizing similar techniques, but the lighting on the flower head is a bit more even. This one is also just a single image with no blending in Photoshop. Hope you enjoyed the images as much as I enjoyed making them. 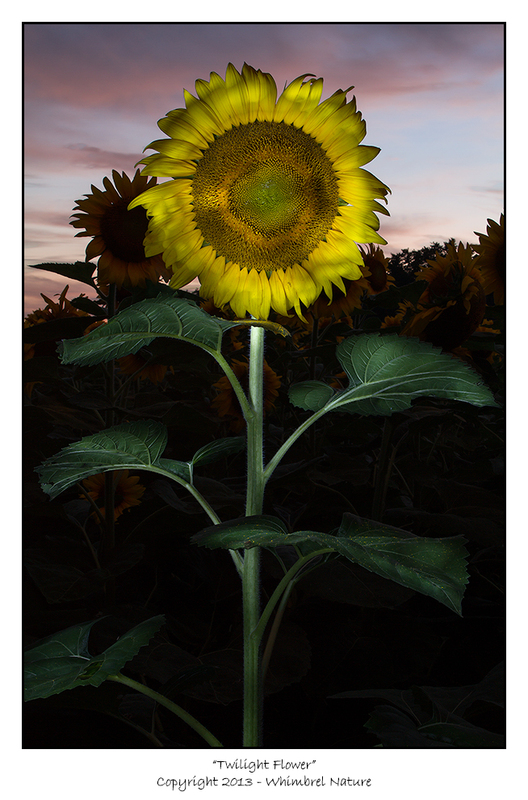 I'll have a post with more sunflowers soon and look for lots more light painting work in the future. Elijah, I think these are the most unique Sunflower images I have ever seen!